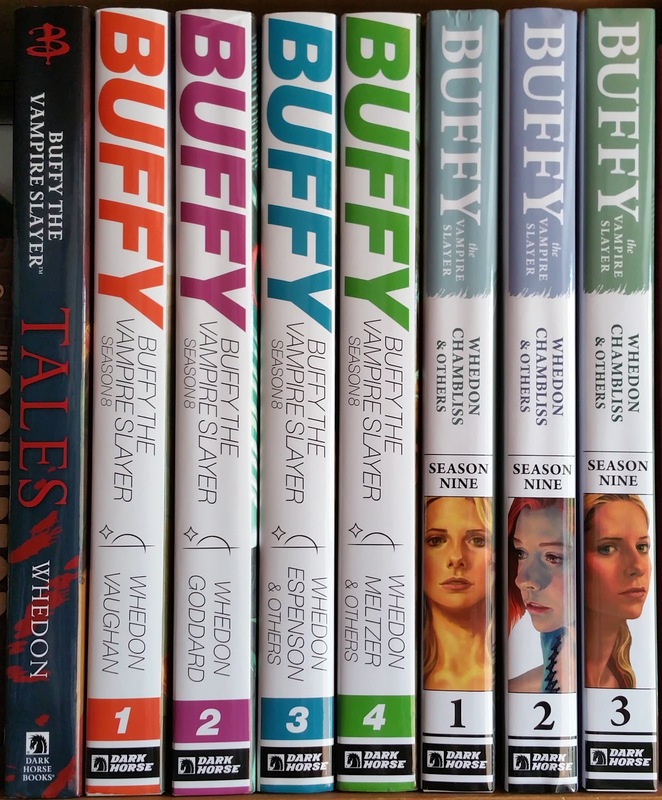 This article deals with Dark Horse Buffy material published in oversized hardcover books (12.4 x 8.3 inches or 31.5 x 21 cm), printed on thick glossy paper, with a bookmark ribbon (see also the end of this article) and edited by Scott Allie. This is the first volume of season 9. Buffy The Vampire Slayer Season 9 Vol 1 was published in January 2015 (ISBN: 978-1-61655-715-7, cover price $29,99, 302 pages). This edition is designed by Justin Couch and here we have a blue green theme design (bookmark included). Second and third of cover feature the same illustration. This edition comes with an illustrated dust jacket and front inner cover, both illustrated by Steve Morris. The inner back cover as well as the second and third of cover (same drawing) are illustrated by George Jeanty. yes, the spine is not numbered .. There is no introduction to this book nor afterword but a two pages creators bio at the end. This volume reprints Buffy The Vampire Slayer Season 9 issues #1 to #10, Magical Mystery Tour Featuring The Beetles from Dark Horse Digital and In Space, No One Can Hear You Slay from Free Comic Book Day 2012. Detailed story credits and contents are displayed below. Chapter break art using all regular virgin cover illustrations are from Steve Morris, Phil Noto and Georges Jeanty with Michelle Madsen. This volume finishes with 34 pages of extra material including an exhaustive cover gallery (see the list below) and a fully illustrated referenced art section (sketches, layouts, thumbnails). There are also two excerpts of Joss Whedon script for issue #1. Georges Jeanty cover for Free Comic book Day 2012.